Sweet is Your heart, Sweet is Your gait, O Lord of all Sweetness in this world , everything about You is Sweet. Sweet are Your movements, Sweet are Your roamings,O Lord of all Sweetness in this world, everything about You is Sweet. Sweet is Your dance, Sweet is Your friendship, O Lord of all Sweetness in this world, everything about You is Sweet. 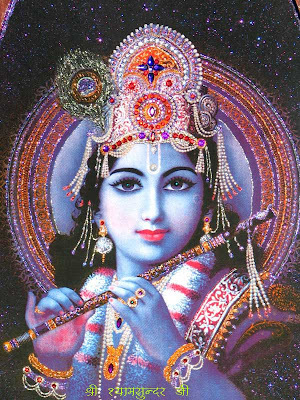 Sweet is Your form, Sweet is the mark on Your forehead, O Lord of all Sweetness in this world , everything about You is Sweet. Sweet are Your offerings, Sweet is Your cure,O Lord of all Sweetness in this world, everything about You is Sweet. Sweet is the water, Sweet is the lotus flower, O Lord of all Sweetness in this world, everything about You is Sweet. What You behold is Sweet, Sweet are Your left overs, O Lord of all Sweetness in this world, everything about You is Sweet. Sweet are Your victories, Sweet are Your jokes, O Lord of all Sweetness in this world, everything about You is Sweet. !! तीनो लोकों से न्यारी, ओ राधा रानी हमारी !! !! तुम ढूढो मुझे गोपाल मैं खोयी गैया तेरी ! !